Japanese growth appears to have peaked in 1Q18, if the latest Tankan survey can be taken at face value, and unlike the official Japanese GDP data, it probably can. But although the headline index fell, and by more than had been expected, there are one or two reasons not to get too downbeat about the Japanese economy just yet. For starters, the non-manufacturing surveys- and diffusion indices for smaller firms- were a lot less negative (indeed, sometimes actually rose) than the large manufacturing series. Though this might simply be a factor of timing. 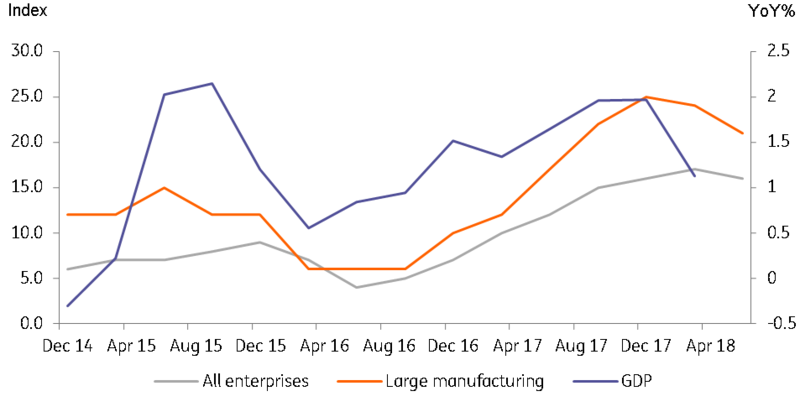 Large manufacturing firms are typically more export-oriented and so have probably been more rapidly affected by plunging sentiment about trade and export orders than their more domestically-oriented and smaller suppliers and service sector support firms. 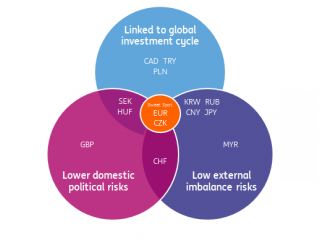 Should the global trading environment worsen further - and we expect it to do so - then it is probably only a matter of time before these other firms go the same way as their larger manufacturing counterparts. Investment has really picked up the pace. And the thing about investment is that when it is growing, it usually does so far faster than the underlying pace of other GDP growth, lifting other sectors in its wake. Admittedly, the profit outlook detailed in the latest Tankan survey wasn't too impressive, but that, in turn, may reflect some higher employment and even stronger wages growth. 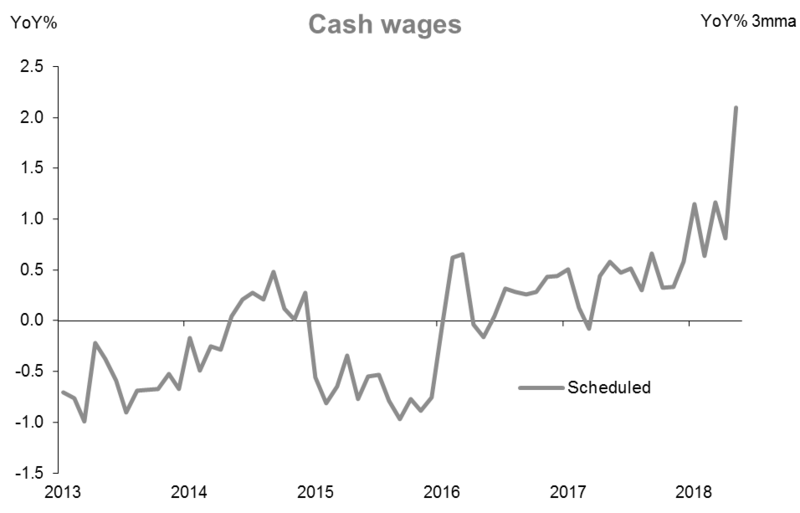 Scheduled cash earnings in April slid back to 0.9% year on year, but this looks like noise, and the recent sharp uptrend in wages growth still looks firmly in place. So all things considered, the Japanese outlook remains reasonably good with stronger domestic demand helping to offset what looks like an unavoidable, but moderate slowdown in the manufacturing export sector. All this leaves the Bank of Japan (BoJ) wrestling with a policy target that it will never reach (2.0% inflation), and the latest tick higher by the Tokyo headline CPI index leaves it barely over a quarter (0.6%YoY) of the target. The 10-year Japanese government bond (JGB) has seen its yield slide in recent weeks, now at just 0.033%. With little pressure for yields to do anything but decline, the BoJ has continued its policy of opportunistic skipping of scheduled bond purchases and flagrant backsliding compared to its targeted pace of asset accumulation. We can only expect this backsliding to continue or even increase as time goes on. Meanwhile, the cover the BoJ has been waiting for from the European Central Bank (ECB) tapering its policy has not been forthcoming, as clever sleight of hand by the ECB has enabled it to move towards a taper, even the end of negative deposit rates, but in such a slow and disappointing fashion in terms of foreign exchange markets, that it has provided little if any diversion for the BoJ to undertake a similar directional move. This is unlikely to change in the current environment, and we have pushed back the timing of the BoJ's own end to negative rates until 2020.